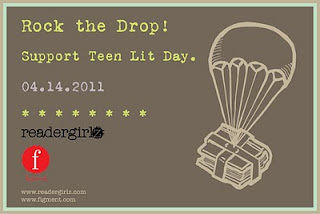 In, erm, support of Support Teen Lit Day, Readergirlz and Figment have created Rock the Drop, which evolved from Operation: Teen Book Drop. Basically, everyone can help get teens to read (and are encouraged to do so on this day) in any number of ways, but Rock the Drop! is about pulling some gently used books from your shelves and dropping them off in a teen friendly zone, to be found and enjoyed. There's a little bookplate you can print and stick in the book to let the finder know it's theirs to keep and read, but of course, a note works, too. It's a genius idea, really. I mean, if you hand a kid a book and say I think you should read this, yeah, they might, but most likely they'll think you're crazy. But if they find this pretty, cool little book just lying around, with a note inside that says "Hey you! I belong to you!" it's like finding buried treasure! I didn't get a chance to drop a book today, but I am most certainly going to be leaving a few books around town. I'm going to carry them with me, and when I see a good place, or the time feels right...that book will find itself set loose on the world. What about you? Are you going to Rock the Drop?